Thin polymer modified cement overlay bag mix systems used to create decorative and slip-resistant texture to new and old concrete. Choose the right concrete overlay material system for the job anywhere in North Carolina and South Carolina. Concrete overlay bag mix materials for safe and non-slip textures like knock-down, wet bubble and slate trowel. Thin concrete overlay microtopping to make concrete look like wood. Pool deck coatings, driveway resurfacing, sidewalk texture repair. Beautify old concrete with the addition of a polymer modified cement overlay system. SureSpray is a thin concrete texture overlay mix product used to create many different designs and textures on concrete floors. Spray from a hopper gun to create knock down texture or a wet bubble look. Trowel SureSpray for slate trowel texture and other decorative concrete overlay options. SureSpray is used to create safe non-slip textures on pool decks, patios, walkways, porches and driveways. TruTop thin concrete overlay microtopping is used for interior and exterior decorative concrete projects. The thin concrete overlay material may be troweled smooth or to a variety of textures including Wood Finish Concrete and other safe non-slip finishes. TruTop microtopping overlay is available in both white and gray Portland bag mixes which may be integrally colored using TruColor color packs. SureStamp is a stampable concrete overlay material system used to create the look of stamped concrete over existing interior and exterior concrete surfaces. SureStamp is a just-add-water concrete overlay mix that is applied as thin as one-quarter inch for use with texture skins and concrete stamps. Color SureStamp with TruColor pigment color packs and finish with EcoStain water based concrete stains for a wide range of stamped concrete effects. SureStamp is suitable for vehicular traffic on driveways and entrances, as well as heavy pedestrian traffic on sidewalks, patios and concrete decks. SureBond is a concrete bonding agent for overlays and cement repair products. SureBond is a just add water single component cement bag mix specifically developed for use with SureCrete Design Products SureStamp overlay system and Deep Patch concrete repair mortar. Contact us for more information on Decorative Thin Overlay Bag Mix Systems, product specifications and material system takeoff assistance. Use the Contact Us page and we will respond as soon as possible. Or call us at (Charlotte) 704-333-4235 or (Raleigh) 919-794-7442. Please stop by one of our showrooms in Charlotte NC or Raleigh NC for more product information on these material systems. 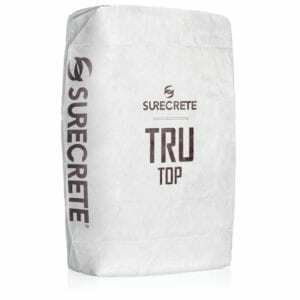 TruTop Micro Topping by SureCrete Design Products is a thin concrete overlay mix that can be applied on floors and walls in North Carolina and South Carolina. Available in a white or gray mix, our thin concrete overlay can be colored with any of our 30 standard overlay colors. TruTop is a single component thin concrete microtopping overlay that is a self-bonding cement based, for interior and exterior concrete surfaces. 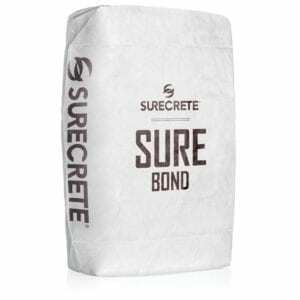 SureBond is a single component, just add water, cement-based overlay bonding agent specifically developed by SureCrete Design Products for use with SureStamp concrete overlay and Deep Patch concrete repair mix. Its function is to join these products to the concrete host surface in North Carolina or South Carolina. The high cement content of SureBond with its dry copolymer agents create a superior bond. SureBond can be colored to match the SureStamp overlay with SC TruColor color packs. SureCrete Design Products SureBroom is engineered to transform old, spalled and broken concrete to a freshly surface in a variety of finish textures. Typical areas requiring SureBroom traffic rated concrete overlay include parking decks, driveways, sidewalks, parking lots, and retail storefronts in North Carolina and South Carolina. SureBroom may be applied with a concrete broom or by a combination of compressed air spray equipment and trowels or squeegee. Concrete repair and concrete surface texture restoration using SureBroom is often more economical than demolition and replacement of concrete slabs. SureCrete Design Products SureSpray is a cement-based sprayable concrete overlay for both interior and exterior concrete surfaces in North Carolina and South Carolina. Perhaps no other bag mix lends itself to such an enormous array of applications, variations, and alternatives: from the simplest of knockdown texture to the elegant Slate Trowel texture. SureSpray may be applied through a hopper gun or texture sprayer, and may also be applied by trowel or squeegee. Concrete surface texture restoration, concrete repair, concrete texture accenting, and creating safe slip resistance of existing concrete are all achieved using SureSpray concrete overlay. Unique polymers form adhesion and flexibility essential in a thin overlay. SureSpray is available in warm weather and cold weather formulations for year round concrete surface texture restoration. Used on existing plain concrete, SureCrete Design Products SureStamp thin concrete texture overlay creates textures that resemble a whole array of designs: tile, cut stone, slate, boardwalk, brick, cobblestone, etc. with traditional concrete stamping tools. Costly tear-out and replacement of existing concrete can be eliminated anywhere in North Carolina or South Carolina. SureStamp stamped cement overlay offers restoration, repair, resurfacing, architectural accenting, and surface protection of existing concrete. SureBond, a cement-based bonding agent, must be used in combination with SureStamp stamp floor overlay to achieve the ultimate adhesion essential in a stampable overlay. 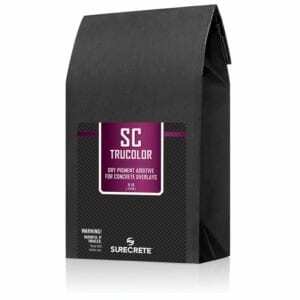 SC TruColor by SureCrete Design Products is better than a liquid color additive. Precision packaging of dry powder pigment takes the guesswork out of coloring concrete overlay systems, helping to provide consistent color throughout the concrete overlay project. TruColor concrete color packs are available from Turning Point Innovations in Charlotte NC. The best decorative concrete overlay systems in North Carolina and South Carolina are available at Turning Point Supply in Charlotte NC and Raleigh NC.